In and around 1998 to 2000 or so, we had an ongoing joke on the Onelist/YahooGroups lists where we'd sign our emails Criss & C___ every time we posted. Eventually after a whole lot of this, it just became Criss& and other hosts/multiples in the group started using "&" tacked on when they were either speaking for the group, didn't know who they were (depersonalizing, thus could not self-identify), or addressing other multiples without being specific as to whom in their system was being addressed, like if they were responding to an email from "Lisa" they'd address the response to "Lisa&" to say "To Lisa and anyone else in there...."
So if anyone has ever seen "&" attached to the end of a name like "Criss&" to indicate "& company" — that started with us as well. 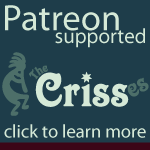 We eventually came up with a system name "The Crisses" and that ended our need for Criss& for our system, but it is still in use in some places online.